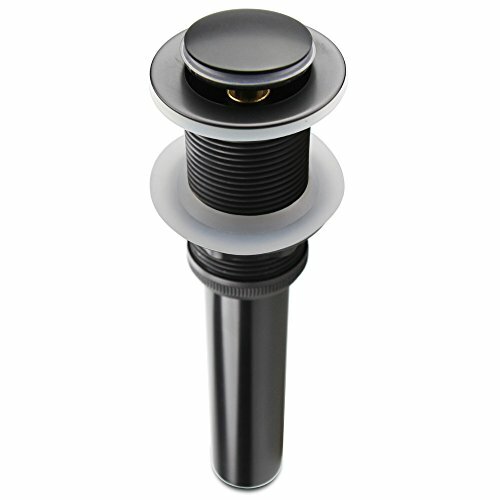 The drain stopper constructed from heavy, genuine brass, and is exceptional quality so that can be pressed more over 10000+ times. It's very easy to use, simply press the top of the pop-up to close, and another press to open. Height (Pop Up Open): 8.3"
Height (Pop Up Close): 7.9"
We specialize in the manufacture and sale of high quality items. Do not wait, Choosing us, you deserve the best! Durable solid brass construction, Black finished. Superior finish is corrosion & rust-resistant. 7.9" height with pop up close, 8.3" height with pop up open. Drain hole diameter of 1-5/8" without overflow. Fit all standard connectors easy to install. If you have any questions about this product by ALLWIN HOUSEWARE, contact us by completing and submitting the form below. If you are looking for a specif part number, please include it with your message.